Microwave chocolate in microwaveable bowl on MEDIUM 3-1/2 to 4 min. or until almost melted, stirring after 2 min. Stir until completely melted. Pour onto waxed paper-covered baking sheet; sprinkle with candy. 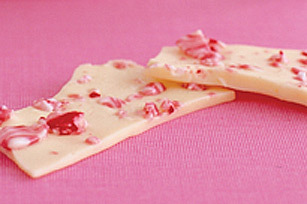 Substitute peppermint candies for the candy canes.